One of George Vancouver's most beautiful and impressive maps. 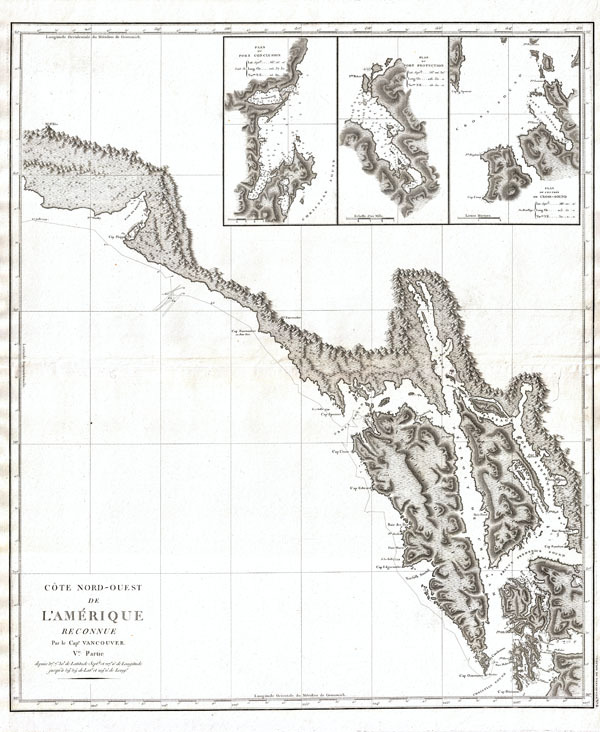 One of the great navigator George Vancouver's beautiful maps, this 1799 chart focuses on the rugged coastline of the southern Alaska panhandle from modern day Yakutat Bay (Baie de Beering) to the Alexander Archipelago (Archipel du Roi George III). Traditionally, this region is the homeland of the Haida and Tlingit Peoples, known for their impressive wood carvings, massive totem poles, and unique culture. This is the first truly accurate and detailed reconnaissance of this forbidding coastline. Vancouver's path as he surveyed this region in 1793 and 1794 is noted. The amazing detail of this chart, the finest mapping of the American this coast to appear for nearly 90 years after its publication, is an extraordinary monument to Vancouver's meticulous nature. This particular example of Vancouver's map was issued as plate no. 8 in the highly desirable 1799 French edition of Vancouver's Atlas. The rare and coveted French edition of Vancouver's Atlas is more beautifully produced with better engraving, higher quality paper, and more detail then the 1798 English edition. This scarce map is a core piece for any serious collection focusing on California, Vancouver, British Columbia, or the Pacific Northwest. Very good near flawless condition. Original centerfold. Platemark visible. Blank on verso. Rumsey 0233.009 (1828 edition). Falk, M.W. Alaskan maps, 1799-4 (1799 ed. ).